You will be given a Free reference e-book to read which has 677 pages And the test will be based on that e-book. Microsoft Certified Technology Specialist or MCTS in Microsoft Office SharePoint Server 2007 Configuration certification is a kind of certification which offers a proof that its holders posses all the skills and knowledge required for them to effectively and expertly handle the Microsoft Office SharePoint Server 2007 deployment and configuration process. If you want to become a holder of this certification, then you need to learn everything about configuring Microsoft Office SharePoint Server 2007. You also need to obtain a general understanding about different Microsoft SQL servers. These topics are often included in the certification exam so you will have better chances of passing it and receiving your desired certificate if you decide to increase the level of your understanding about it. Other topics that are usually included in the MCTS Microsoft Office SharePoint Server 2007 Configuration certification exam are the basics of configuring content management and business forms, steps and techniques in managing business intelligence and administration and all aspects related to configuring personalization, alerts, users and groups and site management. Increasing your knowledge about document, records, workflow and web content management configuration and the management of compliance and polices can also help in passing the test. The good thing about trying to understand all these topics is that you can now seek the help of the free MCTS Microsoft Office SharePoint Server 2007 Configuration certification practice course offered by Brainmeasures. Its free study guide and practice test are the key towards generating the most extensive knowledge about the field. The free MCTS Microsoft Office SharePoint Server 2007 Configuration certification practice course from Brainmeasures is proven to be extensively developed so maximizing your knowledge about the field which can help you in passing the certification test is really possible if you enroll in the course. The free study guide featured in this free practice course is really a major help in your attempt to obtain a clearer overview about Microsoft Office SharePoint 2007, how it is effectively configured and deployed, how you can manage the server and the usual roles and duties that you need to fulfill once you already become a Microsoft Certified Technology Specialist (MCTS) who focuses more on the configuration and deployment of Office SharePoint 2007. The good thing about this free practice course from Brainmeasures is that it also features a free practice test designed to help everyone know the usual coverage of the actual certification test so preparing for it will become a lot easier and more convenient. How to effectively configure Microsoft SharePoint 2007? How to build sites and perform the site collection process? How to effectively configure and maintain libraries and lists? How to efficiently manage the navigation and search feature of SharePoint? How to effectively work with SharePoint’s Microsoft Outlook? How to effectively perform advanced management for SharePoint? 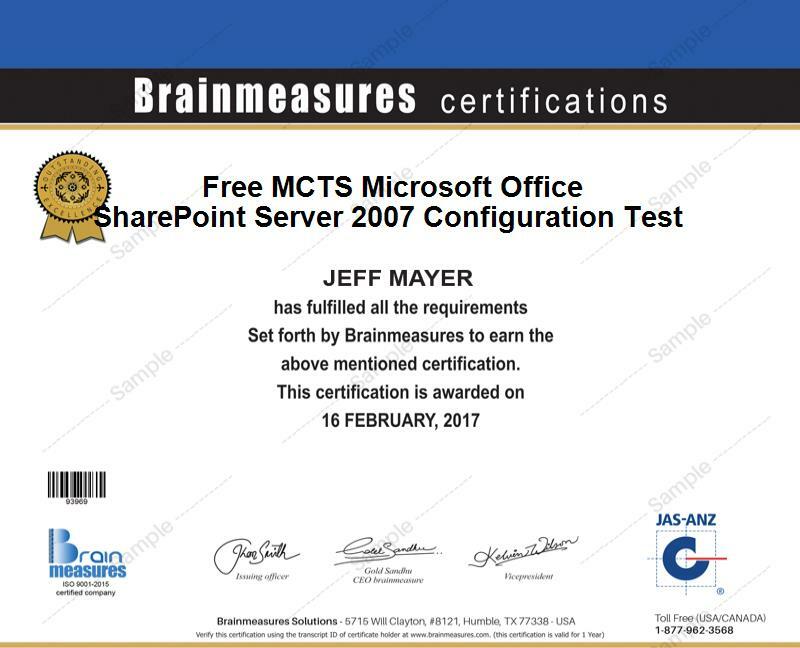 The free MCTS Microsoft Office SharePoint 2007 configuration certification practice course accessible at Brainmeasures is really useful for a bunch of professionals in the industry. It aims to provide help to all those who pass the related certification exam and to other IT professionals especially all aspiring technology specialists who would also like to pursue a career as a business intelligence developer, database developer, database manager and database administrator. Earning an MCTS Microsoft Office SharePoint Server 2007 Configuration certification also entitles you to take advantage of a more rewarding pay. With the presence of your certification, it would be easier for you to work as a Microsoft Office SharePoint 2007 technology specialist and receive an average yearly salary of $84,000. Using your certificate to work as a business intelligence developer will also let you earn around $82,000 to $120,000 every year.